If your future includes a move to Simi Valley, check out Meathead Movers! Our professionally trained student-athlete movers, moving concierge, and princess packers are prepared to get you safely moved into your new Simi Valley home. 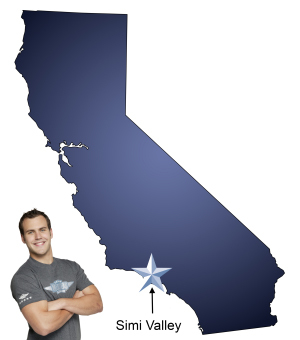 When you make your move to Simi Valley, be sure to contact Meathead Movers. No matter what type of moving service you need, our student-athlete movers are ready to handle all your moving needs. Simi Valley is world famous as the home of the Ronald Reagan Presidential Library. More than one million visitors have made the journey here to pay homage to The Great Communicator and marvel at the Air Force One Boeing 707 on display. Simi Valley is home to nearly 125,000 citizens, many of whom commute to the greater Los Angeles area. If you are new to Simi Valley, you’ll be glad to know that the climate is sublime, the people are friendly, and you’ll get to experience that charming Southern California lifestyle. It’s no wonder so many people want to call this place home. In addition to the Ronald Reagan Library, Simi is home to other famous California historic landmarks. Rancho Simi was the headquarters of the Spanish Land Grant and is located within the Strathearn Historical Park and Museum. Simi Valley is also famous for Grandma Prisbrey’s Bottle Village, which is a fantastic example of 1950s folk art. Built by Tressa Prisbrey, it’s a fanciful assemblage of recycled and reclaimed materials. With gorgeous weather year-round, recreational opportunities abound. The Rancho Simi Recreation and Park District operates two fine golf courses: the Ted Robinson-designed Simi Hills and the 9-hole par-3 Sinaloa courses. There are miles of hiking and biking trails nearby and horse aficionados will love the Arroyo Simi and Coyote Hills Equestrian Centers. Whether you are moving to Simi Valley or are simply relocating across town, Meathead Movers is the best choice to help move your precious possessions. Our polite, attentive, and professional student athlete movers from nearby schools such as Moorpark College, Cal State Northridge, Ventura College, Oxnard College, Pepperdine University, USC, Caltech, Valley College, and UCLA will make your moving day much less stressful. If you are looking for peace of mind and a trustworthy moving company, you’ve come to the right place. We differ from the average moving company by staying active in the community; offering incentive programs; and hiring smoke-free, drug-free, intelligent student athletes who take pride in what they do. Even with long-distance moves, you deal with the same movers at both ends for added confidence and security. Our experienced Simi Valley movers specialize in all aspects of moving, starting with packing or storage and including local and long distance moves. We can also be contracted to conduct on-site relocations and any number of commercial moves. If you are looking for dependable movers, we are here to help! Call us today for a free no-obligation moving quote and experience our revolutionary approach to the moving industry for yourself. Moving to Simi Valley? Here are some helpful resources. View more Simi Valley resources. My "Meatheads" did an excellent job. All of our interaction with Meathead Movers from the call with the coordinator to the meathead movers and through the post move follow up was professional and straightforward- each employee we interacted with was courteous, polite and enthusiastic- all around great service- we are big fans! From setting up the move to finish the Meathead staff was caring, courteous and communicative. Due to my circumstances for the move, the office staff sent me a nice relaxation kit which went a long way to making me feel like a valued customer. The three men who moved the furniture hustled and completed the job with a cheerful attitude and polite manner. I'd recommend this company to anyone who needs movers. We were very satisfied with your services. I think personally what I like the best about using meat head movers is that the guys were very friendly very very courteous and very polite the two that help me Steven who was the head of the crew and Adrian does too work very well together.